Stretching over three nights from May 23 to May 25, Annual Town Meeting addressed topics ranging from lowering speed zones in town to implementing a moratorium on recreational marijuana establishments. Over the course of those three nights, which included two Special Town Meetings, Town Meeting members listened, discussed and ultimately voted on 26 warrant articles. Here are some of the key moments from this year’s Annual Town Meeting. 1. Several of the articles focused on environmental issues. Of the 26 articles that Town Meeting addressed the week of May 22, four dove into the realm of environmentalism. The articles ranged in topic from supporting the Paris Climate Agreement to improving infrastructure for bikes and public transportation. In addition to the Paris agreement and the resolution to support a local option gas tax to improve transportation infrastructure, Town Meeting also looked at an article to rent out the Runkle School roof for a solar panel installation for a lease of no more than 20 years. Also relating to Brookline schools was a resolution to build the ninth school to be a LEED certified net-zero energy school. According to the article explanation, a Net Zero Energy school is a school building that minimizes on-site energy use and generates renewable energy on site. The resolution also called for the high school expansion to be designed to net zero energy standards to the extent possible. All four articles passed during the second and third nights of Annual Town Meeting. 2. Many Brookline High School students participated in Annual Town Meeting. Brookline High School was well represented during Annual Town Meeting. Four students took to the podium to speak in favor of articles ranging from supporting the Paris Climate Agreement to supporting a resolution to participate in the Government Alliance on Race and Equity, GARE. Brookline High School senior Lily Bermel stood in front of Town Meeting members May 24 as the sole proponent for a resolution to support a local option gas tax. Created by Brookline high students in the Envrionmental Action Club, the article asked Town Meeting to support state bill S.1551, “An Act Relevant to Regional Transportation Ballot Initiatives”, which if passed by the state, would allow communities to raise taxes to fund transportation projects. While business owners and Town Meeting members commented on the potential impact of a gas tax on local gas stations, Town Meeting voted to pass the resolution – but the vote did not automatically implement a gas tax. 3. Discussion on racism prompts saxophone performance of “Let There Be Peace on Earth”. While it is not uncommon for Town Meeting members to use props – one Town Meeting member even brought a magnifying glass – new to Town Meeting this year was a saxophone performance of “Let There Be Peace on Earth” by Donnelle O’Neal. O’Neal performed in support of Article 22, which was a resolution to implement the Government Alliance on Race and Equity, GARE. “When students see that our town is using GARE’s model to end institutional racism and work towards racial equity, it sets a model and inspires the youth here in Brookline,” said one Brookline High School student who spoke in support of the resolution. While many speakers delivered passionate speeches, it was O’Neal’s performance that earned the rapt attention of those present. Choosing to let the song speak for itself, O’Neal inspired a standing ovation at the end of his performance. On May 25, Town Meeting voted to pass the resolution. 4. Many speakers referenced the possibility for upcoming overrides. 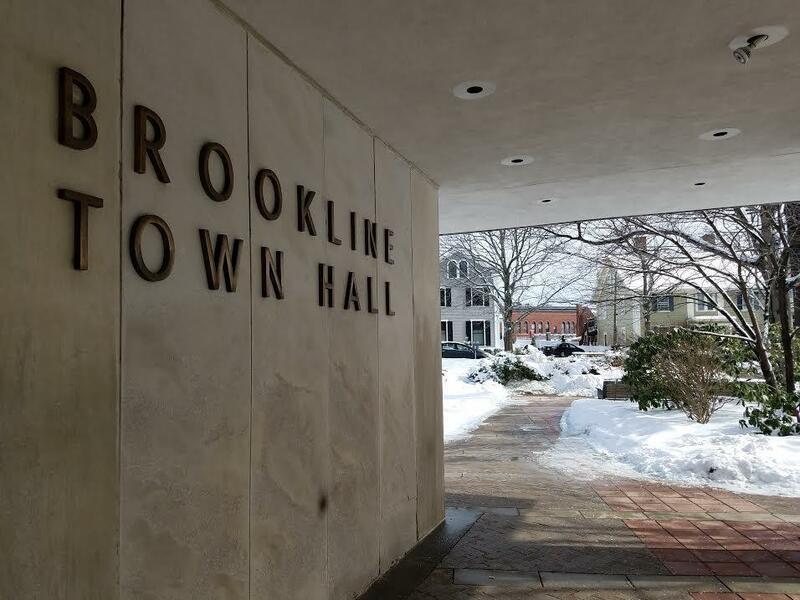 With several projects, including the high school expansion and building the ninth school, on the books for Brookline, several town officials discussed the potential for future overrides. During the first night of Town Meeting on May 23, Board of Selectman Chairman Neil Wishinksy announced that the town would form a committee to study future overrides. Advisory Committee Chairman Sean Lynn-Jones said that Brookline voters would likely be faced with an override vote for Brookline schools in the near future. According to Lynn-Jones, the town would not likely see a special election for an override this year, but would likely see an override question on the 2019 general election ballot. 5. Town Meeting voted to support a resolution regarding the impeachment of Donald Trump. At the conclusion of Annual Town Meeting on May 25, Town Meeting members immediately entered a Special Town Meeting to address a resolution to support an investigation by Congress into grounds for the impeachment of Trump. Proponents of the resolution argued that Trump had violated the Emoluments Clause of the Constitution. In response to a request for an electronic vote, which lists how each Town Meeting member votes, Town Moderator Edward N. Gadsby, Jr,, reminded Town Meeting that the vote was not a vote for or against Trump, but rather a vote either for or against an investigation into his impeachment. The resolution passed with 158 votes in favor, two against and 13 abstentions.